In this study, oleic acid capped magnetic nanoparticles were prepared by a co-precipitation method reported elsewhere. Docetaxel and magnetic nanoparticle co-loaded polycaprolactone nanoparticles were prepared by solvent diffusion method using surfactant F68. Particle size was measured by DLS and verified using HRTEM. FTIR study was used to confirm oleic acid coating on to the magnetic nanoparticles. XRD study was used to confirm crystallinity of magnetic nanoparticles. VSM study was performed to check magnetic property of nanoparticles. High encapsulation efficiency (~70%), burst and sustained release profile of the chosen formulation were established using docetaxel as a model hydrophobic drug. The drug unloaded formulation was found to be biocompatibile (~90% cell viability using L929 mouse fibroblast cell line). 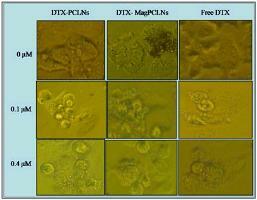 Drug loaded formulation produced equivalent cytotoxicity in the MCF7 breast cancer cells as that of free drug. We therefore, conclude that magnetic polycaprolactone nanoparticles can be used as a promising anticancer drug delivery system in the field of cancer therapy.